Blue Rider Press, 9780399168437, 301pp. Raymond Gunt likes to think of himself as a pretty decent guy he believes in karma, and helping his fellow man, and all that other good stuff. Sure, he can be foulmouthed, occasionally misogynistic, and can just generally rub people the wrong way through no fault of his own So with all the positive energy he's creating, it's a little perplexing to consider the recent downward spiral his life has taken Could the universe be trying to tell him something? A B-unit cameraman with no immediate employment prospects, Gunt decides to accept his ex-wife Fiona's offer to shoot a "Survivor-"style reality show on an obscure island in the Pacific. With his upwardly failing sidekick, Neal, in tow, Gunt somehow suffers multiple comas and unjust imprisonment, is forced to reenact the Angry Dance from the movie "Billy Elliot, "and finds himself at the center of a nuclear war among other tribulations and humiliations. 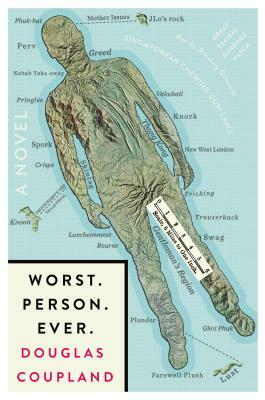 A razor-sharp portrait of a morally bankrupt, gleefully wicked modern man, "Worst. Person. Ever. "is a side-splittingly funny and gloriously filthy new novel from acclaimed author Douglas Coupland. A deeply unworthy book about a dreadful human being with absolutely no redeeming social value, it's guaranteed to brighten up your day. DOUGLAS COUPLAND was born on a NATO base in Germany in 1961. He is the author of the international bestsellers "Generation A "and "JPod," and nine other novels, including "The Gum Thief," "Hey Nostradamus!," "All Families Are Psychotic," "Microserfs," and "Generation X," along with nonfiction works, including a recent short biography of Marshall McLuhan. His work has been translated into thirty-five languages and published in most countries around the world. He is also a visual artist, furniture and fashion designer, and screenwriter. He lives and works in Vancouver. “The plot is an unbridled romp. Absurd scenarios (Gunt is forced, at one point, to perform a Billy Elliott dance sequence on a US military base) are juggled with ludicrous stock characters — including a fabulously naive homeless man, Neal, who is recruited as Gunt’s sidekick. The whole roiling mishmash eventually falls neatly into place for the novel’s Armageddon in the Pacific.